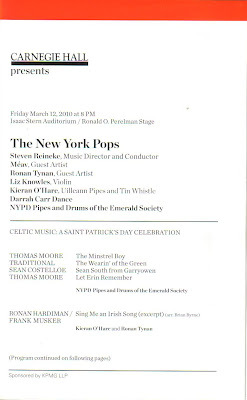 My friend Joe and I, both us with a wee bit o' Irish blood, went to the New York Pops Saint Patrick's Day Celebration at Carnegie Hall on Friday. Pops is usually high on the groan factor - lots of cheesy "pop" covers - there was no exception here, but it was also full of wonderful surprises. 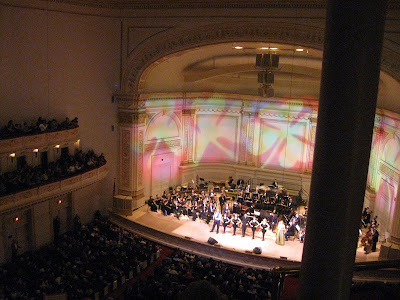 The NYPD Pipes and Drums of the Emerald Society opened the evening - they grandly marched in from the rear of the orchestra, filling Stern Auditorium to the rafters with the traditional highland sound. They looked and sounded fantastic! 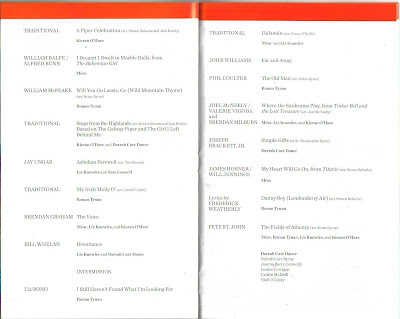 Also a true treat were Kieran O'Hare playing the Uilleann pipes and tin whistle and his wife, Liz Knowles on violin. The Darrah Carr Dance troupe performed thrilling Irish step dancing. 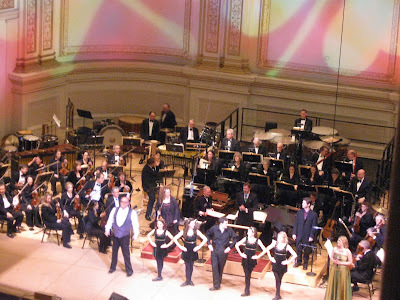 Méav, one of the Celtic Women, and Ronan Tynan, one of the Irish Tenors, rounded out the evening. 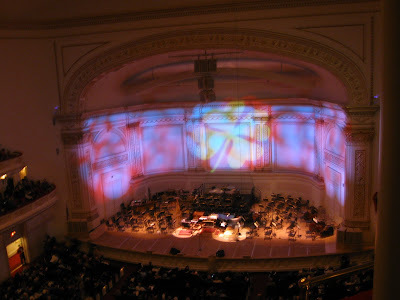 My favorites were especially a duet of Ashokan Farewell performed by Liz and Sara Caswell, a violinist with the Pops, and the Pops Orchestra's performance of "Far and Away" by John Williams, which features the brass. Joe was especially keen on the dancers. 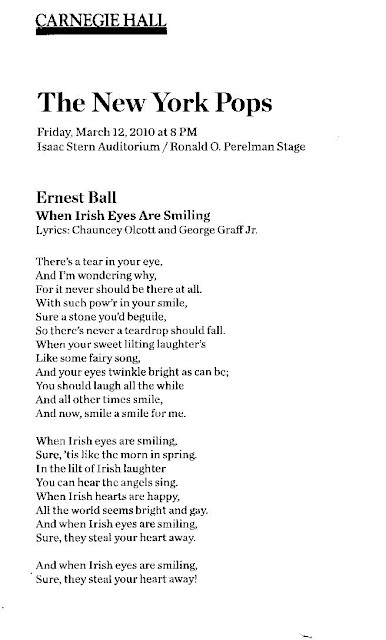 The final song was When Irish Eyes are Smilin', performed by the whole cast and the audience. The whole evening was great fun - the only thing missing was a pint of Guinness! Your camera takes the best pictures!